FmPro Migrator Platinum Edition 7.36 Includes an updated graphic and compatibility with LiveCode Commercial Edition 7.0 for VB6 to LiveCode conversions. Conversion of VB6 forms into LiveCode cards, with code added to individual card objects [Uses: LiveCode Commercial Edition]. Processing of a wide variety of BASIC syntax source files from multiple BASIC IDEs. Quickly process files within all subdirectories of a selected source directory. Converted files are saved as .lc files or individual cards within a new LiveCode stack file. Save many hours of manual retyping, performing the initial code conversion within seconds. Supported statements include: DIM,LET, FOR/NEXT/LOOP/WHILE, SELECT/CASE, FUNCTION/SUB definitions and many more. Sub/Functions are converted into LiveCode "on HandlerName/function FunctionName" definitions closed with "end HandlerName/FunctionName"
SELECT CASE code is converted into LiveCode code with "break" statements added to close each CASE block. Convert older single-platform BASIC code into multi-platform LiveCode projects deployable on desktop, server, web and mobile platforms. The BASIC to LiveCode Conversion Service included with FmPro Migrator Platinum Edition saves LiveCode developers many hours of tedious and error-prone work converting BASIC files into LiveCode code. FmPro Migrator Platinum Edition efficiently traverses all subdirectories of any specified source directory, locating and converting all of the files it has found with the specified file extension (.bas, .vba, .vbs or .txt). The converted files are either saved as folders and .lc files or as individual cards within a new LiveCode stack file. 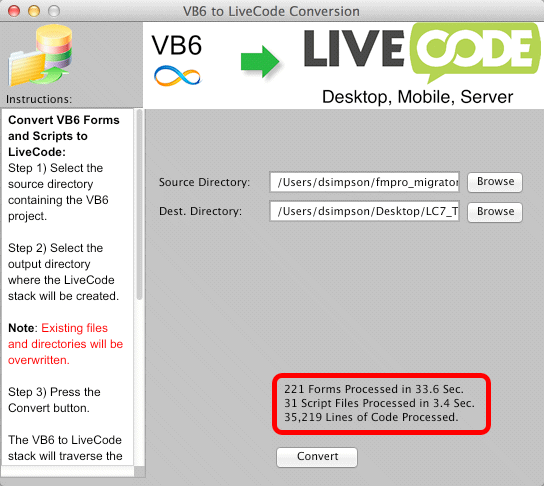 Converts VB6 Forms into LiveCode Cards in Seconds - Even large VB6 projects consisting of hundreds of forms can be converted into a new LiveCode stack within a matter of seconds. As part of the automated conversion process, object-specific code is retrieved from the .FRM file, converted and inserted into the individual LiveCode card objects. Wide Range of BASIC Compilers Supported - The BASIC to LiveCode Conversion Service includes support for a wide variety of BASIC compilers and interpreters. The list of officially supported versions of BASIC include: Microsoft Visual Basic, VBScript, VBA, PowerBasic, ZBASIC/FutureBasic and RealBasic. File from unsupported compilers will still benefit from the conversion of the of the most commonly used BASIC keywords. High Performance Processing - Performing manual processing of even the most common BASIC keywords for a large project could take days or even weeks of work. FmPro Migrator reduces this initial conversion phase for most projects to just a few seconds of processing time. All conversion projects will require manual work in order to reconcile differences between development environments. But using an automated process for the initial conversion phase of the project means that LiveCode developers can immediately start work on the remaining project development tasks. FmPro Migrator also provides a quick overview of the size of the conversion effort. Within a few seconds you will know how many files and lines of code are involved in your entire project. Switch to LiveCode for Multi-Platform Compatibility - Many BASIC development environments were designed only for single-platform deployment. The LiveCode development platform makes it possible to reuse code across the web, desktop (Mac, PC or Linux) server and mobile platforms. An Economical Learning Tool - Are you new to the LiveCode platform? Do you have thousands of lines of BASIC code scattered in dozens of different project directories? 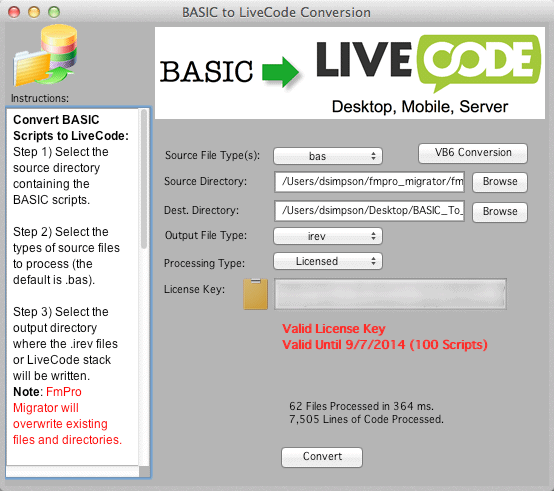 The BASIC to LiveCode Conversion feature is an indispensable tool which can help you quickly get up to speed converting your existing code to the LiveCode platform. Private/Public Subroutine and Function Conversion - BASIC Subroutines and Functions are converted into handlers and functions within the converted LiveCode code. Private Subroutines become private commands, and public Subroutines become regular handlers. The End Sub/End Function keywords are converted into End <Sub/Function Name> to complete each Subroutine or Function. The ByVal keyword has been replaced with the @ symbol, which passes the variable by reference into the handler. 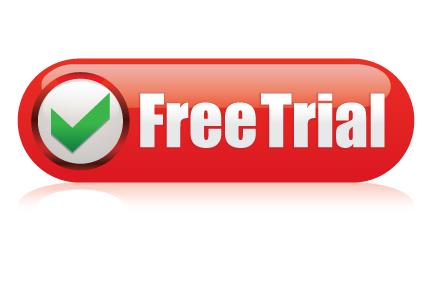 MsgBox "Please enter a valid amount"
answer "Please enter a valid amount"
Code Comments and Indenting - Comments and most code indenting will be passed thru into the the commented LiveCode code unchanged in order to improve readability as well as documentation. Variable definitions are modified to remove size info, and BASIC variable name suffix characters are removed for assignment and definition statements. Program.Name1$ = "Sentry D.R. (old) 618-000"
DIM C$(25) : REM bad sizes,bad id code to be sent to error message. local C -- REM bad sizes,bad id code to be sent to error message. SELECT/CASE Conversion - SELECT/CASE statements are converted into switch/case statements in LiveCode. The CASE ELSE keywords become the default CASE condition and a break keyword is added at the end of each CASE block. Once again, the ByVal keyword has been replaced with the @ symbol, which passes the variable by reference into the handler. Loop Conversion - FOR/NEXT, WHILE and LOOP statements are converted into the simplified repeat/end repeat keywords used in LiveCode. Variable Renaming - BASIC variables are modified to remove the data type suffix characters including $, % and # characters. For variables on the left hand side of the assignment operator and DIM statements the variable names are also checked against the list of LiveCode keywords, and renamed by adding an underscore character suffix if a name conflict has been found. REDIM statements are commented out, because a REDIM statement can either clear a BASIC array or resize the array. Variable assignments involving arrays (single or multi-dimensional) are converted into LiveCode arrays using square brackets instead of parenthesis. Some functions and keywords match so closely in functionality that a simple search & replace can be done on the code to perform the conversion. Some of these conversions are listed in this table. Due to the complexity associated with any code conversion project, it is recommended that a small test project be completed prior to starting the full conversion project. By default, FmPro Migrator Platinum Edition will process 5 scripts in demo mode without requiring a license key. There is also additional information in the FmPro Migrator BASIC to LiveCode Conversion Manual (PDF). FmPro Migrator Platinum Edition - FmPro Migrator Platinum Edition includes the BASIC to LiveCode Service licence key providing unlimited usage of this feature throughout the duration of the license key. The VB6ToLiveCode Conversion feature is included with FmPro Migrator Platinum Edition. This feature is implemented as a LiveCode stack running within the LiveCode Commercial Edition IDE. VB6 forms and code are converted into a new LiveCode stack, having the converted Visual Basic code directly embedded within the newly created card objects. 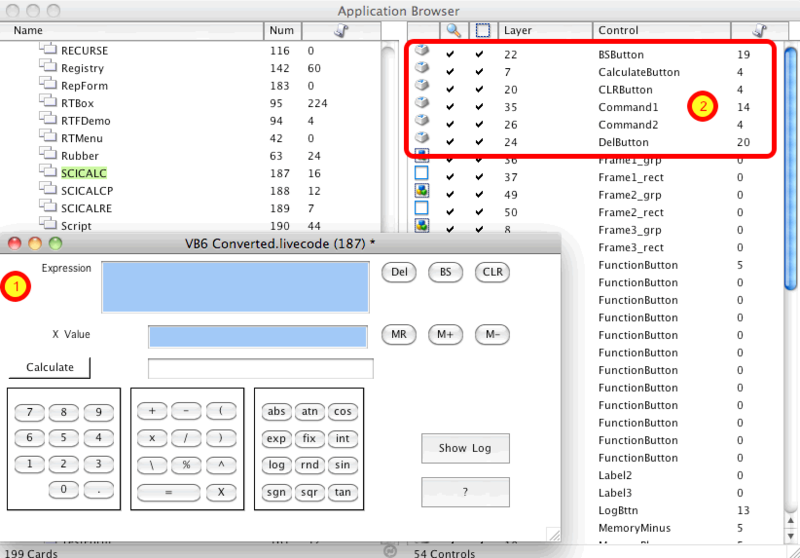 This screen shot (1) shows the VB6 SCICALC.frm form (scientific calculator) converted into a LiveCode card. In the background (2) the objects on this card are being displayed within the LiveCode Application Browser, also showing the number of lines of code which have been inserted into the objects when they were created. On the left hand column the SCICALC card also has 16 lines of code placed into the card script. The card script will include any scripts which are not assigned to any individual form object, and which might be called globally by any of the objects. The original VB6 DelButton_Click() Sub code shown above, has been converted into the LiveCode code shown below. The LiveCode version of the script has been syntactically converted to match LiveCode syntax as shown above. The dot notation used to reference properties has been replaced with the equivalent LiveCode script. These object property names will need to be manually changed to reflect the properties of LiveCode objects. There are 17 commonly used VB6 form objects converted into equivalent LiveCode objects, shown in this table.